Also known as double V-belts, are designed for use on drives with one or more reverse bends. They usually transmit power from both sides of the belt. To meet the multiple-bend and dual-power requirements, ContiTech builds Hex belts with rugged Vytacord tension members. They deliver maximum strength with minimum elongation. 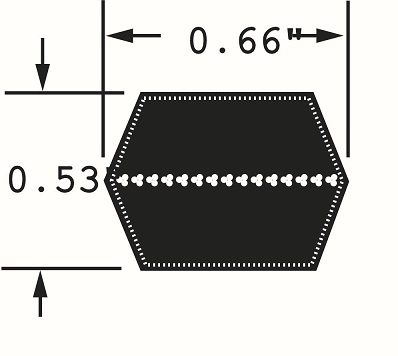 Hex belts are available in AA, BB, and CC cross sections. A special Dry Can Hex construction is available with a special deep CC cross section designated CCP. Key Features and benefits: Dual-sided classical profile. High-strength Vytacord tensile members.Oil, heat, ozone, and abrasion resistant. Static Conductive. Applications: Used on drives having one or more reverse bends and usually where power must be transmitted to or from the belt in both the usual and reverse positions. Lawn and garden equipment, Agitators, Conveyors, Mixers, Mule Drivers, and Crushers. See pulley section and if you have any question Contact Us.